The black-headed gull (Chroicocephalus ridibundus) is a small gull that breeds in much of Europe and Asia, and also in coastal eastern Canada. Most of the population is migratory and winters further south, but some birds reside in the milder westernmost areas of Europe. Some black-headed gulls also spend the winter in northeastern North America, where it was formerly known as the common black-headed gull. As is the case with many gulls, it was previously placed in the genus Larus. The genus name Chroicocephalus is from Ancient Greek khroizo, "to colour", and kephale, "head". The specific ridibundus is Latin for "laughing", from ridere "to laugh". This gull is 38–44 cm (15–17 in) long with a 94–105 cm (37–41 in) wingspan. In flight, the white leading edge to the wing is a good field mark. The summer adult has a chocolate-brown head (not black, although does look black from a distance), pale grey body, black tips to the primary wing feathers, and red bill and legs. The hood is lost in winter, leaving just 2 dark spots. Immature birds have a mottled pattern of brown spots over most of the body. It breeds in colonies in large reed beds or marshes, or on islands in lakes, nesting on the ground. Like most gulls, it is highly gregarious in winter, both when feeding or in evening roosts. It is not a pelagic species and is rarely seen at sea far from coasts. To be found over much of Europe, except Spain, Italy and Greece. It is also found in Japan and E China. It is an occasional visitor to the east coast of North America. in flight near Großenbrode, Schleswig-Holstein. The bird is in a near-vertical position. ^ Butchart, S.; Symes, A. (2012). "Larus ridibundus". IUCN Red List of Threatened Species. 2012: e.T22694420A38851158. doi:10.2305/IUCN.UK.2012-1.RLTS.T22694420A38851158.en. ^ Jobling, James A (2010). The Helm Dictionary of Scientific Bird Names. London: Christopher Helm. pp. 104, 171. ISBN 978-1-4081-2501-4. ^ "Longevity, ageing, and life history of Chroicocephalus ridibundus". The Animal Ageing and Longevity Database. Retrieved 27 September 2015. ^ Copping, Jasper (28 March 2009). "Top restaurants face shortage of seagull eggs". The Daily Telegraph. London. ^ "Conservation (Natural Habitats&c" (PDF). Archived from the original (PDF) on 2010-04-14. ^ Evans, Madeleine H. R., et al. “Black-Headed Gulls Synchronise Their Activity with Their Nearest Neighbours.” Scientific Reports, vol. 8, no. 1, 2018, doi:10.1038/s41598-018-28378-x. Wikimedia Commons has media related to Chroicocephalus ridibundus. 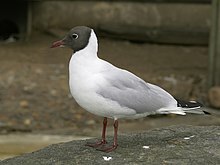 Look up black-headed gull in Wiktionary, the free dictionary. "Common black-headed gull media". Internet Bird Collection. Audio recordings of Black-headed gull on Xeno-canto. This page was last edited on 18 February 2019, at 03:41 (UTC).